Lorenzo Bini Smaghi is the Chairman of Societé Gènèrale. From June 2005 to December 2011 he was a Member of the Executive Board of the European Central Bank. 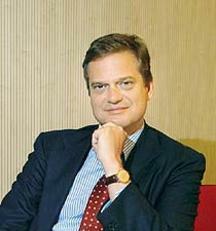 He started his career in 1983 as an Economist at the Research Department of the Banca d’Italia. In 1994 he moved to the European Monetary Institute, in Frankfurt, to head the Policy Division, to prepare for the creation of the ECB. In October 1998 he became Director General for International Affairs in the Italian Treasury, acting as G7 and G20 Deputy and Vice President of the Economic and Financial Committee of the EU. He was also Chairman of the WP3 of the OECD. He has been the Chairman of the Board of Snam, of SACE Spa, and member of the Boards of Finmeccanica, MTS, the European Investment Bank and Morgan Stanley International.